EXTON, Pa. - Sept. 19, 2018 - PRLog -- Laser-View Technologies is pleased to announce a distribution agreement with EESCO, a division of WESCO Distribution Inc, effective immediately. Under the terms of the agreement, Dimetix laser distance sensors and DIS sensors non-contact MEMs sensors, along with the Crane Sentry® family of overhead crane monitoring systems manufactured by Laser-View Technologies, will be available at 11 EESCO locations in Florida, Illinois, Indiana, Michigan, and South Carolina. "EESCO is a great partner for Laser-View Technologies. They have the scale, infrastructure, reputation, experience and complementary line card to help make Laser-View Technologies a market leader," said Steven Lubeck, President of Laser-View Technologies. "We are happy that EESCO recognized the quality, robustness, innovation and design quality of Laser-View Technologies product offerings and accessories." 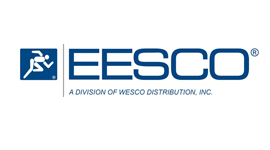 EESCO, part of WESCO Distribution Inc, is a leading Automation distributor of MRO (maintenance, repair, and operating) products, construction materials, and advanced integrated supply procurement outsourcing services. EESCO offers products for industrial automation featuring Rockwell Automation, MRO products, lighting and energy solutions, general supplies, industrial consumables, renewable energy, safety and wire and cable. All the products and supply chain solutions your business needs to run faster and more efficiently – you can find them at EESCO! Laser-View Technologies, Inc. was founded in 1999 and is a distributor of non-contact measurement sensors and a manufacturer of smart non-contact measurement systems and solutions for industry. We concentrate on long range, rugged Dimetix laser distance sensors distributed by Dimetix USA, DIS sensors industrial inclination sensors from DIS Sensors USA, and the Crane Sentry family of overhead crane position and collision monitoring systems. Dimetix USA is the authorized US distributor of Dimetix laser sensors, which can measure out to 500 meters with up to 1 mm accuracy. Solutions built around these sensors interface with several common control platforms, such as Allen Bradley and Siemens. DIS Sensors USA is the exclusive North American distributor of DIS Sensors bv industrial MEMS-based inclination sensors, tilt switches, accelerometers, and a unique line of non-contact, sealed hall-effect absolute rotary encoders. The Crane Sentry family of overhead crane position and collision monitoring systems provide the ability to define and monitor protected zones, such as walkways or areas containing machines or in-plant offices, within a crane bay. Crane Sentry products are used by major crane manufacturers and service providers, such as KoneCrane. Products are sold through our distribution network and distributed and supported directly from our US headquarters.